Just because it teaches you how to play 21 more songs in 6 short days does not mean you’ll exhaust its educational value in under a week. The authors have packed even more resources and teaching material into this powerful learning tool. Learn popular songs covered by famous artists, including Burl Ives, Phish, Nina Simone and more. All titles are public domain. Click the book cover to see the full song list inside. Discover new playing styles, including fingerpicking melodies, fingerpicking accompaniment, solo ukulele (where you play melodies and chords at the same time) and more. FREE Video Instructionals for All 21 Songs. Learn faster and easier by watching the authors show you how to play every song on video. Access the videos with your free membership to the authors’ website. A DVD is also available. How to play faster songs with more rhythmic control and play slower songs with richer sound. Lots of ways to play each song – all songs include standard music staff with a treble clef, tab notation and tab diagrams. Plus, most songs include several strumming patterns for different skill levels and musical variety. The Blues made easy – learn the 12 bar blues, new chords with the blues, and let your creativity run wild with blues improvisation. Easy-reference chord glossary with illustrations and photos show you exact finger placement for each chord. And many more tips and techniques that sharpen and beautify your ukulele playing skills. This book is set up like private lessons. It starts you off with how to read melodies and tab and a few essential playing techniques. You then dive into the songs where you’ll develop more advanced skills as you progress from easiest to most challenging. 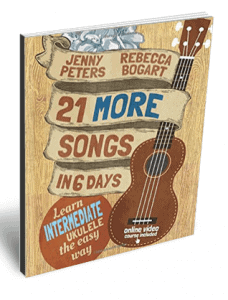 And once again, you learn directly from a Grammy award nominated music teacher and a former Harvard master class piano teacher… the same duo who developed and authored the best-selling “21 Songs in 6 Days” how to play ukulele curriculum. This new book and the free video lessons are designed to upgrade your ukulele skills quickly and easily. And before long, you’ll be amazed at what you’re capable of playing. Get your copy now. You’ll be glad you did.